These guys must have thighs made of Kevlar. A mathematical word problem, by Luke. Click on the image to view fully. Of course, you'll be wanting that answer. But then, the answer hardly matters after that question! love the thighs! Luke's hilarious. That is absolutely hysterical!! I'm sure Luke's teacher has never had a child so precocious! This is great! He is so creative! Uggh... you'd think I married an English major, and not a Chemical Engineer. Great job Luke! Just one technicality (I am a little bit of a stickler when it comes to math). On the answer for the number of nails, you wrote 3X5=45 but I know you meant 3X15=45. Sometimes it is hard for the fingers to keep up with the brain when you are putting ideas onto paper. Great job and originality. When I saw the speedo's I thought it must be your dad! i see now where the comment on the speedo and nails came from. YOU ROCK when it comes to creation/writing. So cool- Oh, man! 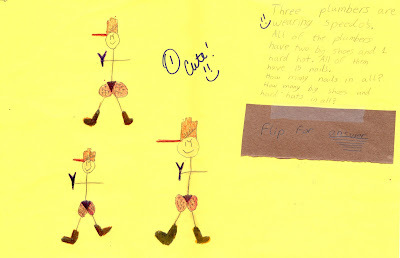 The drawings are hilarious, and very explicit... Love them!